I paid a return visit to the Brewhouse & Kitchen in Lichfield, and discovered some delicious surprises on their new menu. Last year, I visited the Brewhouse & Kitchen in Lichfield shortly after it opened. It’s an interesting concept, where the food on the menu is matched with an extensive range of beers and lagers. I really enjoyed my first visit to the pub. So when they asked me to go back to try out the new Spring 2018 menu, I was very happy to accept the invitation. We had dinner at the pub after our Brew Day experience, which is a fantastic day making beer with the pub’s head brewer. You can see the video from our day here, and I’ll be posting a full blog post about the Brew Day next week. When we finished our beer-making session, I enjoyed a cold pint of Three Sticks, the pub’s own American Pale Ale. We then headed out for a quick walk around Lichfield, which is such a historic city. It’s definitely somewhere that I want to explore further! We headed back to the Brewhouse & Kitchen for dinner and were greeted by our friendly waitress, Jessica, who we had also met on our previous visit. The pub’s menu is not the biggest that I’ve seen, but it has a fairly wide range of options. You can go for a tapas-style sharing menu, enjoy a burger or hot dog, or pick from their range of main courses. Gluten-free, vegetarian and vegan options are clearly marked on the menu, and there’s a small selection of salads and puddings. We opted to share two small plates as our starter. And although it was tempting to go back for the fabulous buffalo wings and loaded nachos from our last visit, I really wanted to try something new. So we chose the Mac n Cheese Melts with chilli jam, and the Korean BBQ Breaded Tofu, which is one of the vegan options on the menu. I really enjoyed the Mac n Cheese Melts, which were savoury, creamy and comforting. I would have liked a little more spice in the chilli jam, but that’s a personal preference. It was a very tasty starter. And Mark’s pick was the Korean BBQ Breaded Tofu, and I really liked these crispy little bites with a sweet and spicy BBQ sauce. The slaw was fresh and crunchy, which contrasted well with the soft interior of the tofu pieces. Mark was going to be driving us home that evening, so he was sticking to soft drinks, while I had opted for the Three Sticks again! It’s a light pale ale, with a hoppy aromatic flavour. I really like this style of beer, and it went very well with my food. The pub was quite busy on the evening of our visit, which was to be expected for a Saturday night. But our main course turned up promptly, without a long wait between courses. Several of the items on the pub’s menu are prepared using beer. And I have to be honest, I really wanted to go for the IPA-battered fish and chips again. It was so good when I tried it on my last visit! But instead I decided to try one of the burgers. There’s a small range to choose from, which includes one vegan option. You can also customise your burger with a variety of additional toppings. And they all come in a soft sourdough bun, which is really tasty. I had picked the Buttermilk Fried Chicken burger – southern fried chicken topped with salad, dill pickles and onions. The chicken was very tender and lightly spiced, and I really enjoyed the sweet pink onions. It came with a side of crunchy deli-style slaw and plenty of the Brewhouse & Kitchen’s fantastic garlic and hop skin-on skinny fries. I did order one item from my last visit though. I couldn’t resist a portion of the amazing IPA battered onion rings, which are still the best onions rings I’ve ever had. The batter is incredibly light and crisp, and the tender, sweet onion rings inside are cooked to perfection. Mark fancied trying the pie on the menu, which is one of the options prepared using beer. The Chicken, Ham Hock and Weissbier pie has two layers of crisp puff pastry, enveloping masses of chunky pieces of chicken and ham in a creamy, savoury sauce. He really enjoyed it, and I definitely enjoyed the piece that I sampled! The pie was served with a buttery potato mash, and pan fried purple sprouting broccoli and sugar snap peas. I was really pleased to see that the veg had plenty of colour and were not overcooked at all. It’s so easy to get something as simple as this wrong, and it can really ruin a meal when it’s served with badly prepared sides. But these were crunchy, full of flavour and a great accompaniment to the hearty pie. And we thought it would be good to try out some of the other beers which are available on the extensive menu at the Brewhouse & Kitchen. Head Brewer Gabriele Vanzo had explained to us that beer is not usually suitable for a vegan diet, because of one of the additives used to clarify it. But the Brewhouse and Kitchen do have one beer on their menu which is vegan-friendly. I tried the Citrus Tide unfiltered lager, which is light, dry and hoppy. I could really imagine drinking this on a hot summer’s day! Citrus Tide is also one of a small selection of beers on the pub’s menu which is gluten free. And Mark spotted that the menu also had one low-alchol beer. He decided to try a bottle of the Erdinger Low Alcohol beer, which has 0.4% alcohol so it’s not quite alcohol free. It’s crisp and very refreshing, and made a welcome change from another glass of cola! Our puddings arrived and as usual, I was envious of Mark’s choice! I had picked the Lemon and Lime Posset, which was really tangy and creamy – just the way a good posset should be. The raspberry coulis on top ofthe posset gave an interesting sweet contrast, but I wasn’t completely sold on the orange polenta biscuits served alongside. I prefer something more delicate with a posset, and these were a little too solid for my taste. But Mark’s pudding really stole the show. He had chosen the vegan option on the dessert menu. Neither of us are vegan, but we both feel that we’d like to cut down on our meat consumption. And we are also finding that vegan options are often lighter and more interesting. On this occasion, the vegan pudding was a Chocolate and Coconut Tart served with vegan vanilla icecream and toasted coconut. The tart was incredibly dense and rich without any hint of bitterness. The dark, malty Ameliorator Porter which brewed at the Brewhouse & Kitchen would have been an excellent match. And the tart’s shell was crisp and chocolatey, so I was amazed to see that this pudding is also gluten-free. I’ve never been impressed with dairy-free icecreams before, but this was very creamy and had a lovely flavour. I could happily have eaten the whole of Mark’s pudding and would have had no idea that it was a vegan recipe if I hadn’t seen the menu. Our meal was complimentary, but the bill for this meal would have come to £58.75. That includes three courses, a side dish, and two drinks each, so I think that’s pretty good value. 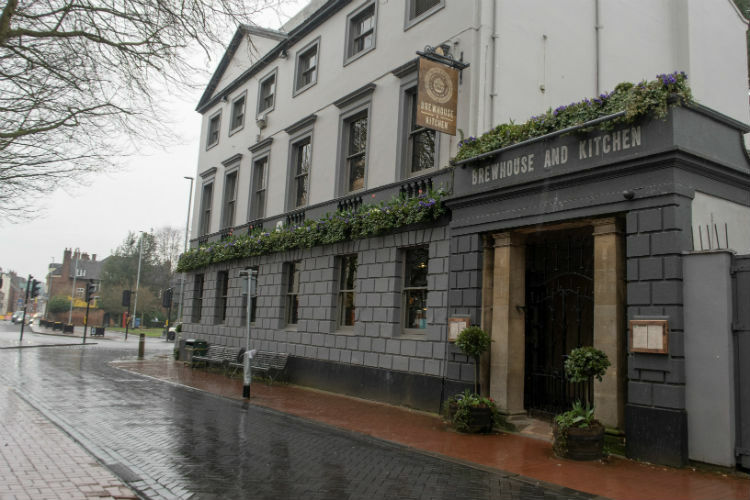 The Brewhouse & Kitchen Lichfield is a very friendly pub with a great atmosphere and lovely surroundings. We thoroughly enjoyed our meal, and I’d definitely recommend paying them a visit if you are in Lichfield. And if you’re not near Lichfield, then you can check out the Brewhouse & Kitchen website to find a location near you. Thank you to the staff of the Brewhouse & Kitchen Lichfield for another great visit!